Our Community Leads had announced 5-6 days before only that People from Mozilla, California are coming Delhi to meet Mozpacers’ community and ,So in a very short time We planned everything and decided 13th Feb for Mozcoffee , Everybody is really excited for the day . Finally the day has come, So at around 3 pm ajay reached at the Venue along with Special guests of this event “Sara Haghdoosti and Jochai Ben-Avie”. They were welcomed by beautiful Flowers bouquet . 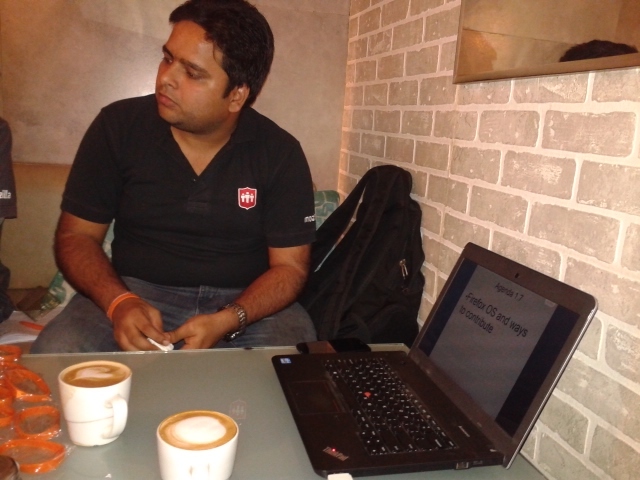 Then Ajay started Addressing audience ,Mozcoffee is a platform where we share the roadmap of our community , talked about what we accomplished in the past and also met new contributors who want to contribute in our community. Then our womoz lead took the charge and explained about participation of women in Mozilla. 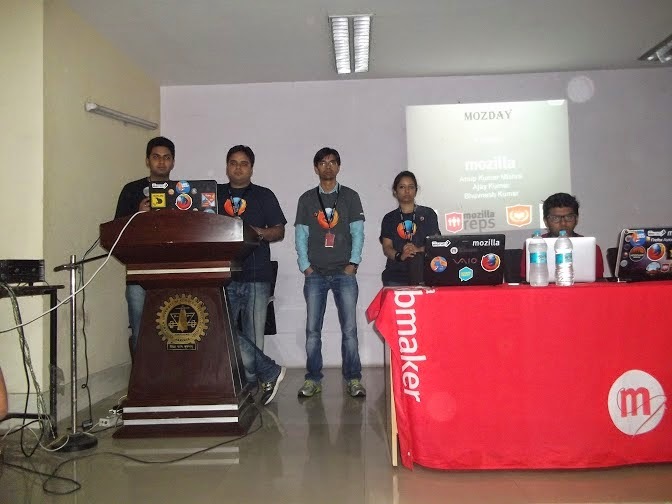 So then, Mozpacers’ Website has been showcased by Tech Core Contributors and explained how this website would help new contributors know about Community,Contribution paths and events. After that We welcomed Sara and Jochai on the stage to interact with the audience ,they talked about “Internet Privacy” and “Advocacy”. Finally at 5 pm students have been given some refreshment and we arranged two help desks ie. “Technical” and “Non Technical” respectively ,there we cleared audience doubts and queries. Once Audience left from there,Sara and Jochai spent some time with the Core contributors ,asked about our queries and challenges we are facing in contributing to Mozilla . Some read them as Obstacles and ,others read them as Opportunities. 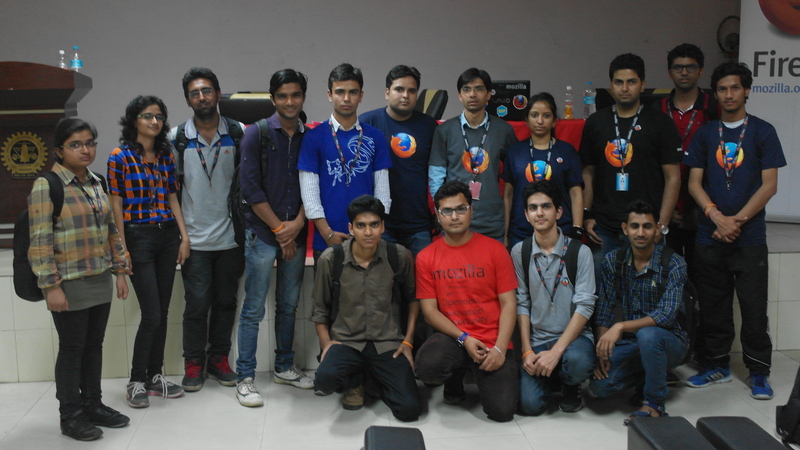 This time I got opportunity to be a speaker in one of the great Mozilla Event “MozAge” at NIIT University Neemrana (Rajasthan). Being the Core contributor of Mozilla Delhi Community I was shortlisted to Speak and take Workshop on Webmaker Tools – Thimble and X-ray Goggles .I always enjoy spreading Mozilla Mission in whatever way it is because there is an Internal beauty and cause hidden behind the Shared mission and Global Community of Mozillians all over the world working together . 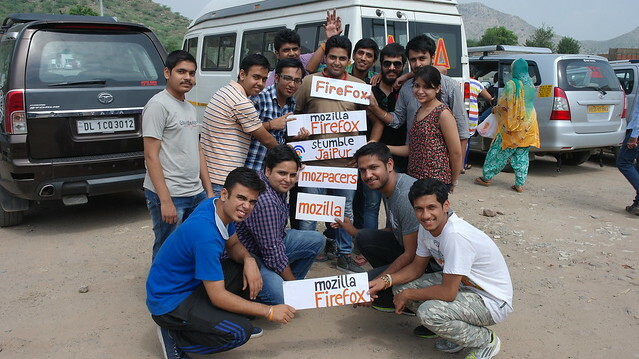 We ,Mozillians from different regions had met at Iffco Chowk,Gurgaon and set off for the journey to NIIIT University Neemrana from Gurgaon .We got late due to huge traffic jam in Gurgaon ,so we took some snacks for all of us and landed on the University Campus @ around 12 am. During the journey also I had lot of things going on in my mind as I was going to speak first time being the Mozillian in front of huge no. of audience and i don’t want it to be the last . I wanted to do something special , So that the faith ,the Mozilla Leads Mr. Anup, Ajay and Bhuvnesh have shown towards me, would stay forever. After reaching there ,We are welcomed by the Energetic students there who were really excited for the Event . We settled down ,got refreshed and conducted a small meeting with Students, who had planned this Event, to discuss about the whole agenda of the Event day . After finalizing the agenda we went for sleep so that we could wake up fully refreshed for the coming meetup with Students. 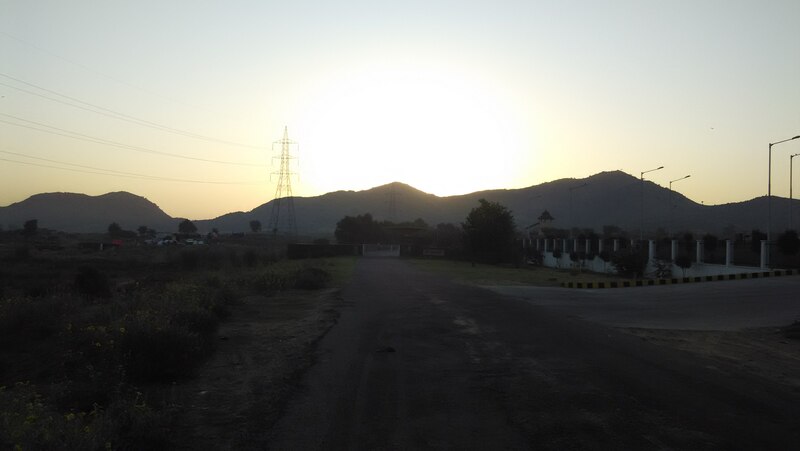 Here comes the Beautiful Morning with the early tinge of sun rays marked the beginning of the my Journey to NIIT University Neemrana .Believing in Mozilla’s mission i stepped up and accepted the challenge as Opportunity 🙂 . After taking healthy breakfast we started for the Auditorium. Here we reached . Wow ,The auditorium was looking beautiful . An Inaugural Ceremony took place where the college authorities welcomed us . Finally the commencement of proceedings started and Anup and Ajay took the stage for the first sesssion.They gave Introduction about the event “MozAge” and introduced Mozilla Representatives who went as a team for the event. 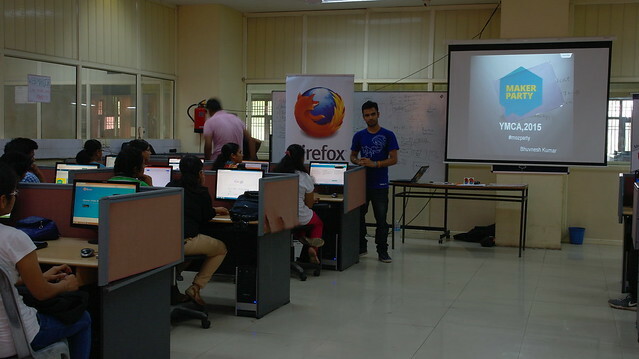 Thereafter Anup and Ajay started with the first session “Introduction to Mozilla & its Mission”. 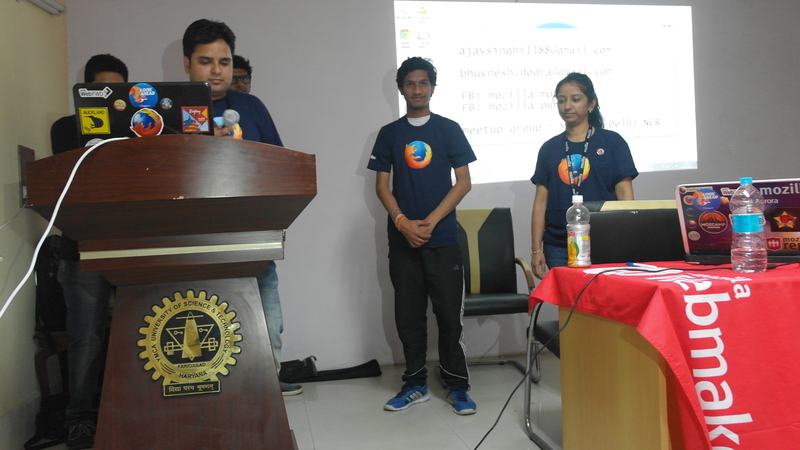 We guided students about Mozilla’s Mission and showed them a path how they can start contributing for the same and introduced about our local community Mozilla Delhi (Mozpacers). Then an Awesome Womoz Session was taken by Pushpita (Womoz lead in Mozpacers) ,She explained and talked about the Women Empowerment in Mozilla .Also introduced about Mozilla’s Executive Chairwoman “Mitchel Baker” .Women present in the Auditorium then got excited about contributing in Mozilla Community . Following this Kunal and Harsh grab the stage to start first Workshop on Security .Harsh introduced some security concepts interacted with the students .After that Kunal started the hands on Workshop showing students live code and Vulnerablities in the Code Scripting and how they could remove those Vulnerabilities from your code in any language. Also he awarded students with some swags who answered his questions correct. The Workshop was ended with a great round of Applause by audience. Then we had a lunch break of around 25 minutes ,took lunch . After Lunch It was mine Workshop and i was little nervous but after taking food and refreshment ,I got ready for my workshop with my fellow mozillians Saurabh and Kanika. I started the Thimble and X-ray Goggles Workshop showing one Video and asking some questions to students.Then moving Forward I introduced Webmaker and What its core Purpose and then Saurabh made audience understand Web Literacy Map and the phases it includes so beautifully .My Coordination with Saurabh had become so good that we comfortably switched to each other Topics without any glitch 🙂 . After then I introduced and guided about X-ray Goggles Tool ,What is it used for .Kanika had shown them the Live demo of building a “X-ray Goggles Make” also .Students also asked some questions and so the environment made really cool and interactive .I also distributed some cool Swags who answered my Questions and also presented their own X-rayGoggles makes at that time . 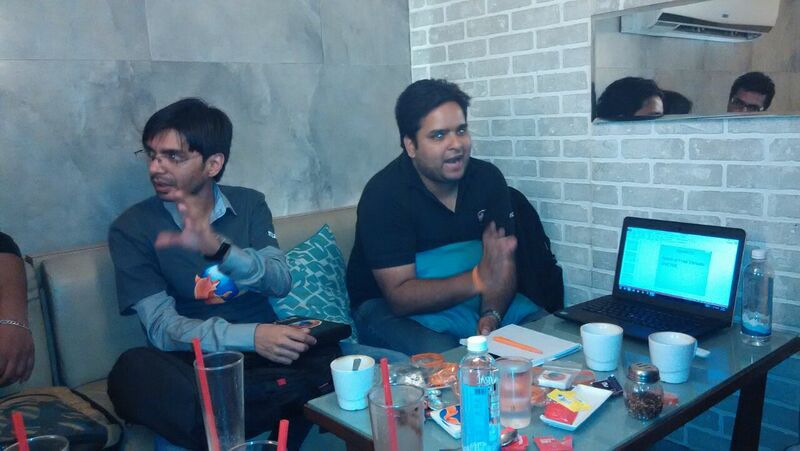 Then I had given Mike to Saurabh to give introduction about Thimble and show them the Live demo on How to Use Thimble . Then after demo i asked students to explore thimble Features which we have not told them yet . 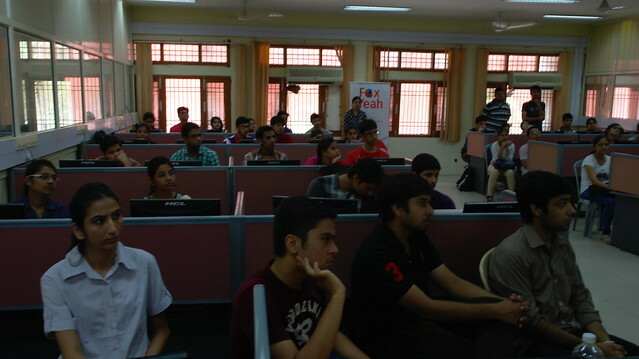 Students were really innovative and explored a lot of features there . 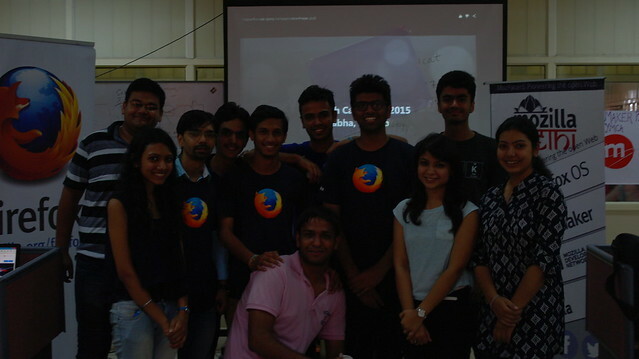 After that me Saurabh and Kanika ended that workshop again with one Video “Are you a Mozillian” EveryOne shouted at the end of the Video “Yes I am A Mozillian” “Yes I am the Maker of the Web Now” .Then i realized “Yes Chirag you have done it” 🙂 . Then Event got continued by Bhuvnesh on “Webmaker for Android” .He explained The Concept behind Webmaker for android and showed live presentation of the steps on How anybody can Participate on the Web With this Application and We Mozpacers got Successful again spreading the Mozilla Mission in NIIT University. After Event we also distributed Trophy’s and Certificates who won in the different events (Codethalon,Treasure hunt etc.) conducted by the Event Organizers. Then we had a meet with students there who invited us , they asked about how they can form a FSA club in the University and be part of Mozilla. My Motive for this event was successfully completed and very happily me with my team forbade the University staff and students there and left the venue with some wonderful and unforgettable memories. For me it was something different. 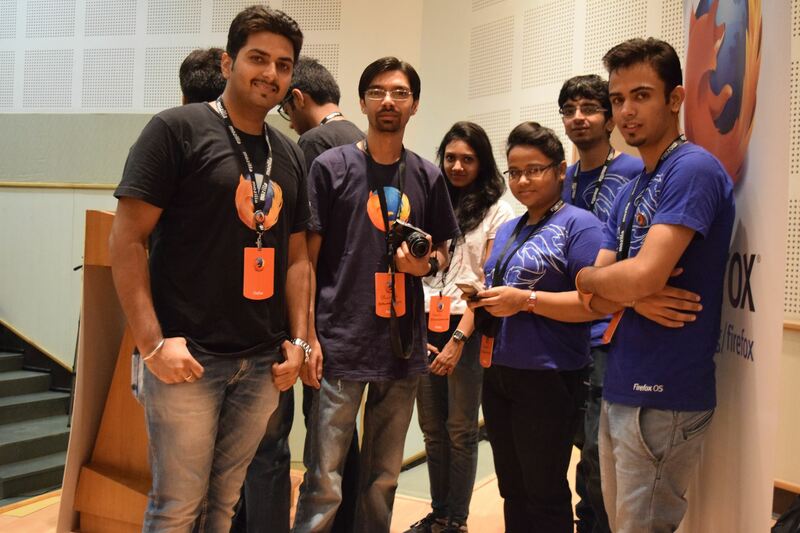 There’s still lot to improve and the determination and the skill set possessed by the Mozilla Delhi team was simply amazing to perceive. 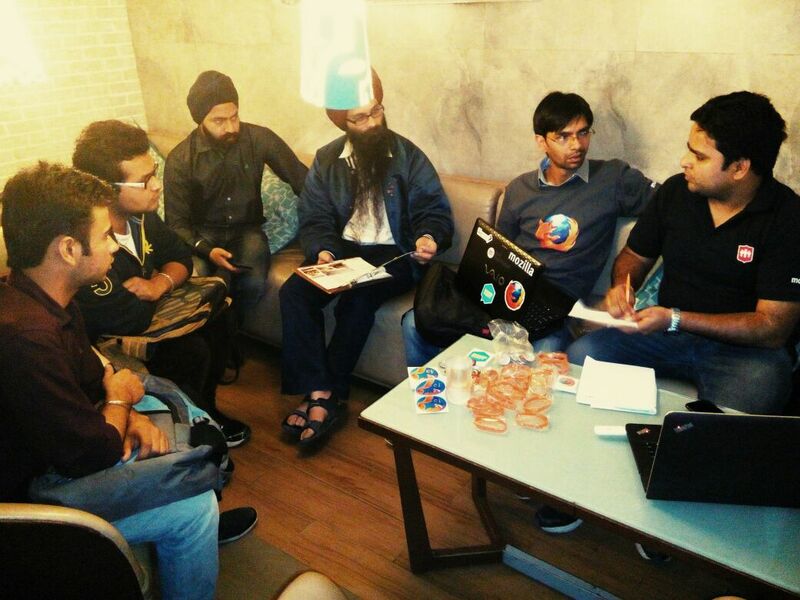 It was an awesome event with a lot of interaction and a lot of exposure.Looking forward to organize more events so that I would have always been part of spreading Shared Mission and Awareness about Open Web and the Global Community “Mozilla” . 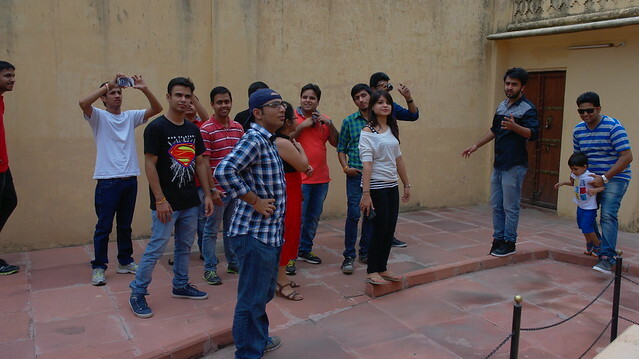 Some days before Me with Shubham, Prateek, Sameer, Anshuman, Aashu, Vipin announced actively in college to make the “Maker Party” word spread around the college. 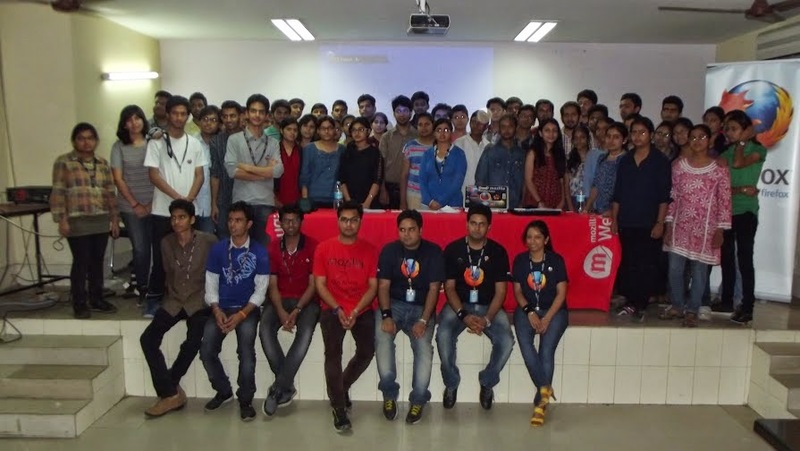 So finally the 8th of August 2015 ,Maker Party Date has come and Me and My Team of Fellow mozillians are all set to have a great Maker Party . I appreciate Aashu’s work ,she had made amazing Art (MozArt) ,Charts etc for the event. Bhuvnesh has started with Introduction to Mozilla Community ,Why Mozilla ,How the Mozilla is working and the benefits the students could get contributing to Mozilla Products ,talked about our local community Mozpacers and much more. He really made the environment cool and interactive. 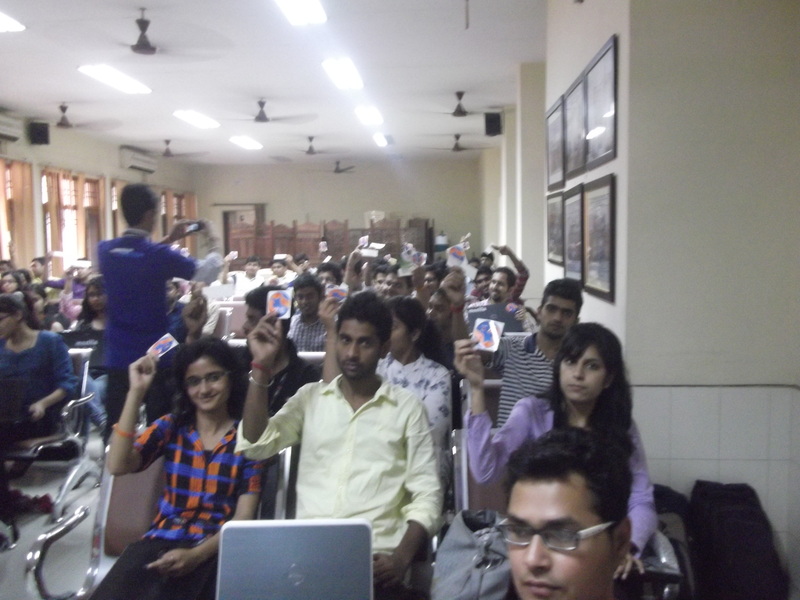 Also we distributed some goodies to students who had answered the questions smartly asked by us (Mozillians). 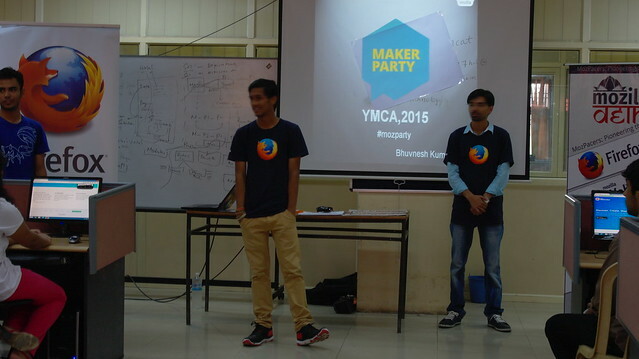 After Bhuvnesh I have tried to build a feel like a Party in tha hall .I have introduced all about “Mozilla Maker Party” ,how these Maker Parties are full filling the mission of Mozilla . I told the Activities we would be doing in the Event and hacking on some code together .Also asked some Questions on Webmaker like Why it is named “Webmaker”. and more just to make the event more interactive. Then I invited all my Team one by one to introduce about themselves .They shared their experience with Mozilla community and what they improved and learnt being in the Mozilla. So after this Prateek hold the stage and started teaching Webmaker tools .He started with X-ray Goggles ,given live demo how to use X-ray goggles and hack code from any website so easily . Students asked various questions and also got satisfactory answers from Prateek .Then He taught about Thimble tool giving live demo on how to use that tool . Attendees was also doing that practically on their PCs and laptops ,using Thimble and X-ray goggles and also made some awesome makes using these tools. 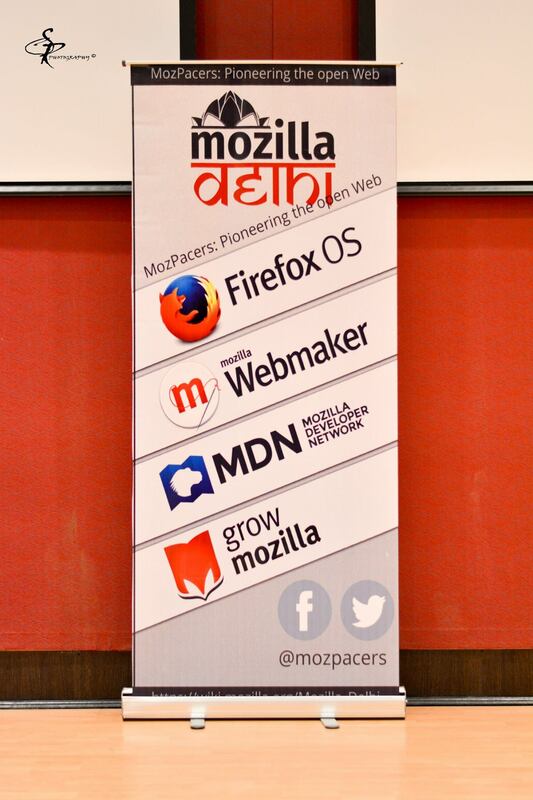 Finally Shubham took over and gave presentation on the most recent project of Mozilla “Webmaker for android”. He explained the significance and how anybody can participate in the web rather than only being the consumer of the Web. He explained from the very small steps from installing the Webmaker App to making the makes just by dragging and dropping the images and inserting text 🙂 . 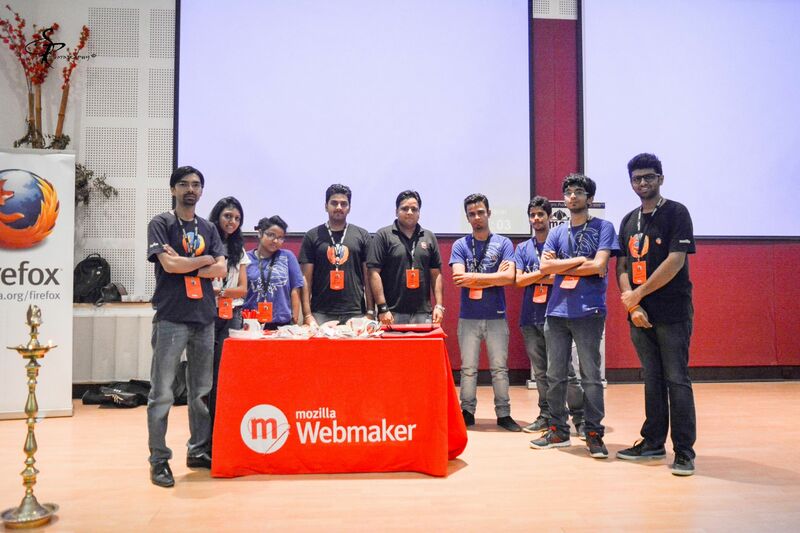 All were really excited and happy to be a part of Mozilla Maker Party , also we got some more contributors and FSAs who are interested to contribute with their skills and talent to awesome Mozilla projects out there. 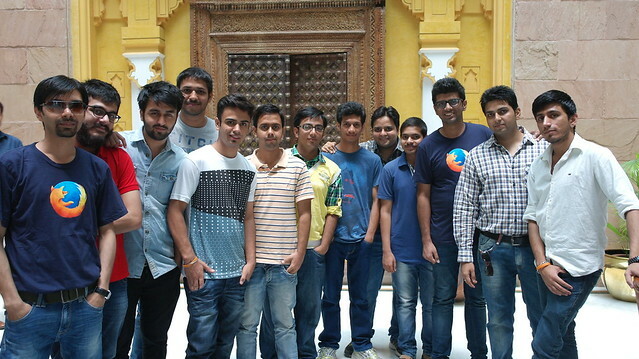 Just I thought i might share the thrilling and unforgettable experience with Mozpacers in Mozilla Stumbler Trip at Jaipur. 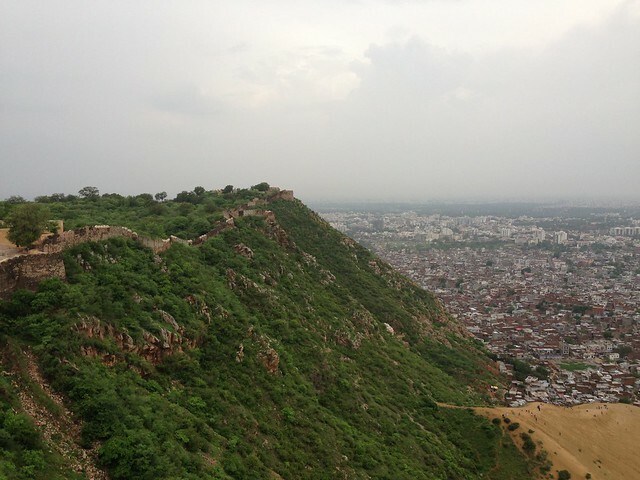 It was really great Journey from Faridabad to Kashmiri Gate 😛 and then to Awesome place :The Pink City: “Jaipur” . 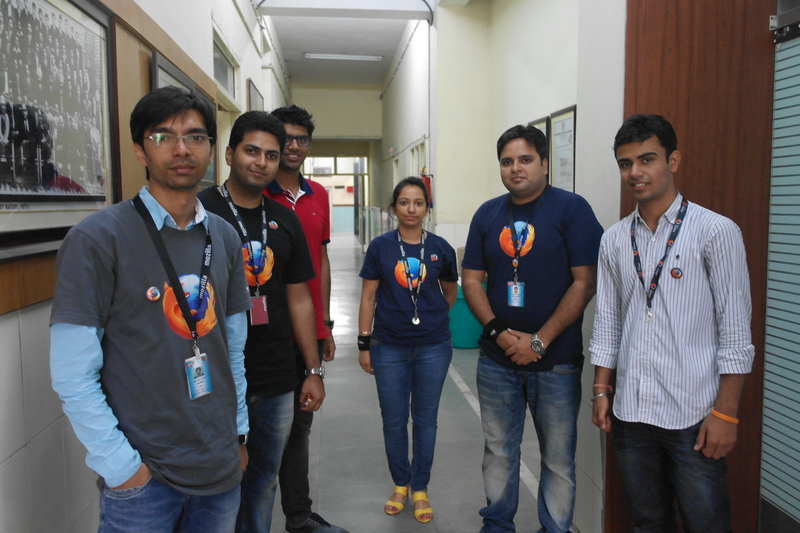 Actually We, the Mozpacers planned to contribute to the New and recent trending Project of our Mozilla i.e.. Mozilla stumbler which is related to improving the location services for Firefox OS. Therefore this trip of around 1000kms was planned in which 16 mozpacers got chance to gather around and travel together with the main motto of Stumbling a lot. So on 18th Early morning at 3am we started our journey and collected at Kashmiri gate,New Delhi ,a decided place to collect all mozpacers here and start our way head to jaipur. We started trip ,enjoyed a lot .First Game was really a trap game for almost every team member and only from then our Team bonding had been started to be more strong .We listened a variety of songs, played Card Games ,Specially Bluffmaster 😛 on the way. We also stopped on an onroad Restaurant,taken some morning tea/Coffee and some snacks . 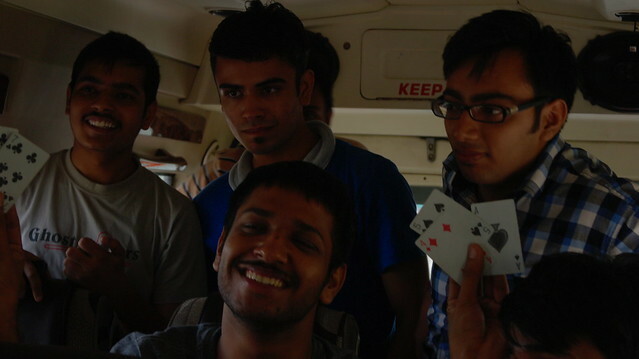 At 11am we had taken our MozBreakfast at a Famous HotSpot (I don’t remember the name :P) on Highway to Jaipur . 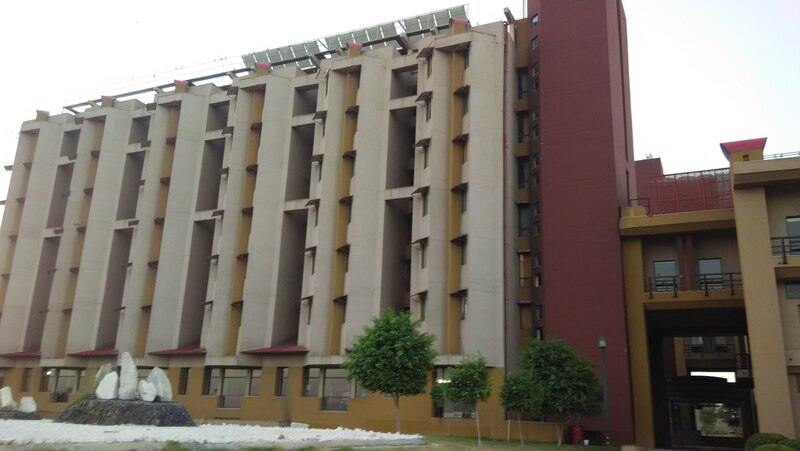 Finally we reached at our Hotel named “Mansingh Hotel” around 12:15pm,we then got refreshed and at 1pm we started stumbling around the Jaipur, had awesome lunch outside and visited some really worth heritage forts and places i.e.. Jantar mantar,Nahargarh fort of great ancient maharajas. The best Part is the Weather was really awesome and cool. It was Raining for sometime but after rain, weather had become really pleasing with cool winds. At around 7:30 pm we reached hotel again and there after some refreshment we gathered together to spend most of the time with the team. After Dinner we discussed about our community Website first, the problems we were facing and found some solutions to take this Mozilla Delhi Website Project to its completion asap. 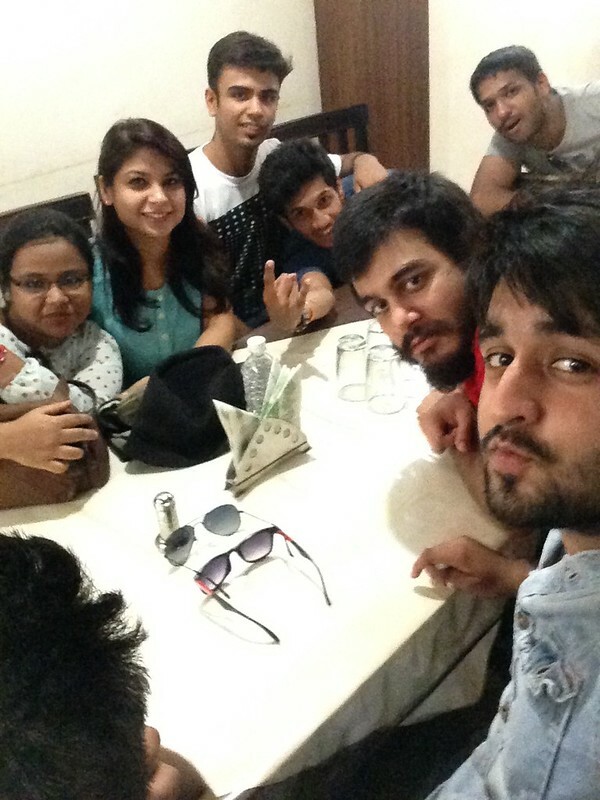 Then we shared our fun moments and some Real Ghost Meeting Stories 😛 as well 😀 . Then Most of the team members had gone for sleep at 1 am, but me with Four Buddies played some Card games and went to sleep around 3 am. The next day in early morning we checked out from Hotel after taking Breakfast and also took each and every community member video present in the trip.So we headed our way to the Next Stumbling Spot “Amer Fort” It was really worth seeing and we also hired one guide to guide us and tell all history about the fort. 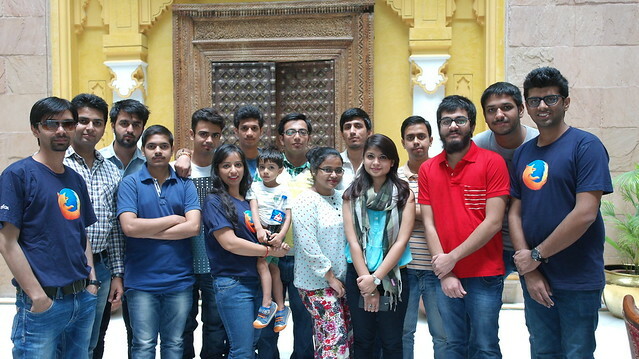 I am really thankful to all my Team mates to make this trip so En-joyful and unforgettable. never imagin ed but from the late night it was raining heavily in the city and so our enthusiasm got a bit low and our event also got some delayed. But inspite of bad Weather we started event ,Anup and Ajay sir, great speakers, started by introducing themselves talked about Why we are here! . 10-12 volunteers were made there to manage the whole event and support Mozilla Reps making this event a huge success and given some badges and bands to identify in the audience. 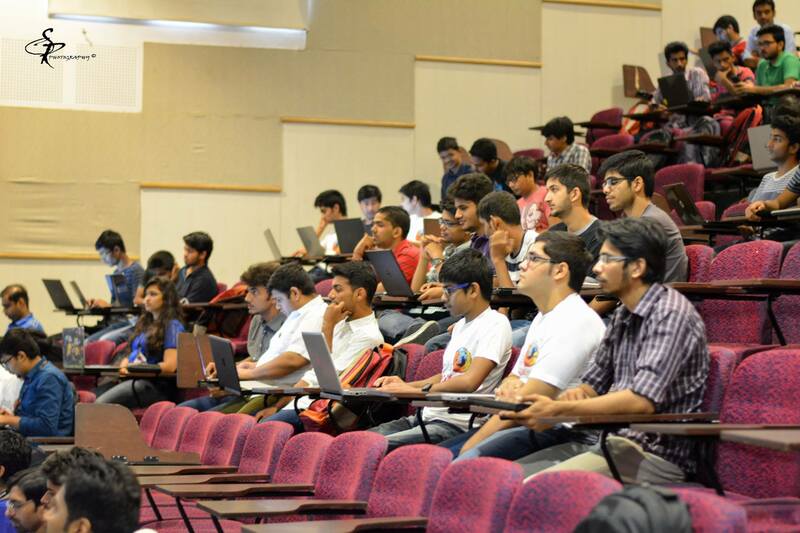 Mr. Anup talked about how this event planned to happen in our college.And then introduced the power of Open source and introduced about Mozilla products,mission and its existence in the market. This whole session was pretty interactive and random questions were also put up in the audience related to Mozilla and the students who were answering ,were rewarded with special mozilla Swags. 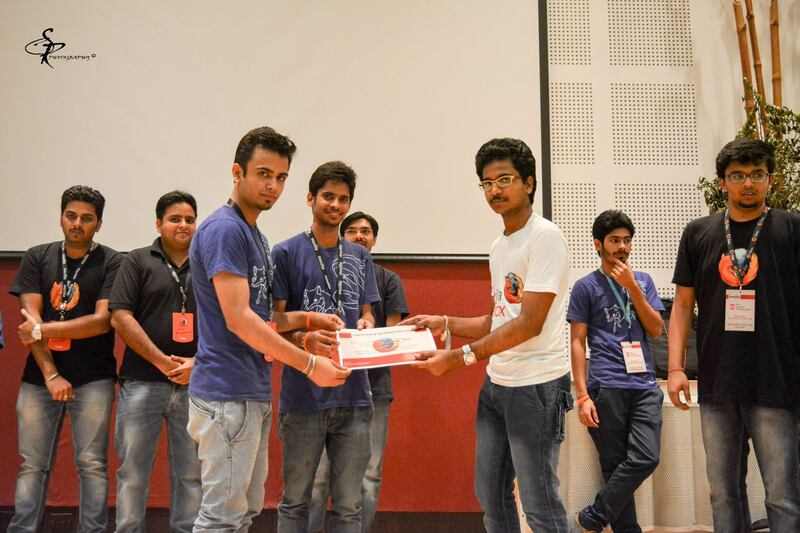 Suddenly surprisingly respected Ajay and Anup sir called me and my friend and awarded us Mozilla T-shirts as a sign of appreciation for conducting such a great event in our college. It was really my best ever moment i could never forget. Then after taking lunch, Mr. Bhuvnesh explained about GIT and how git can help us for their file/code’s version control and how can GIT work in Mozilla development network. 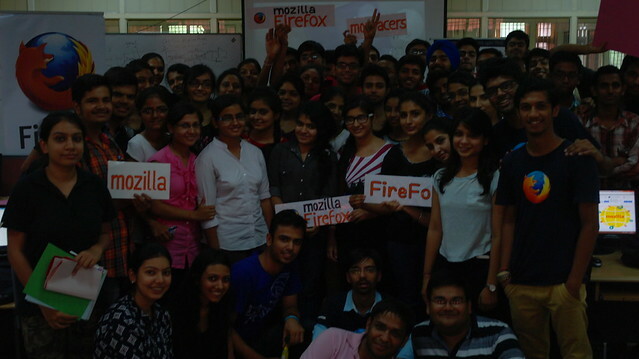 Mozilla team has then taken quiz and screened students on the basis of results of Quiz for recruiting Firefox Student Ambassadors. Gradually event stepped up and one of the most Interesting Topic of the event “Webmaker” came up and Mr. Ajay and Anup sir demonstrated live usage of various cool Webmaker tools like X-ray goggles,Thimble maker ,popcorn maker ,It definitely build up enthusiasm in the students. At the same time Archana mam and Ajay sir interviewed the students for verbal discussion for FSA program on the basis of quiz results.In last phase we had one to one interaction with students and we added 24 students as FSA. 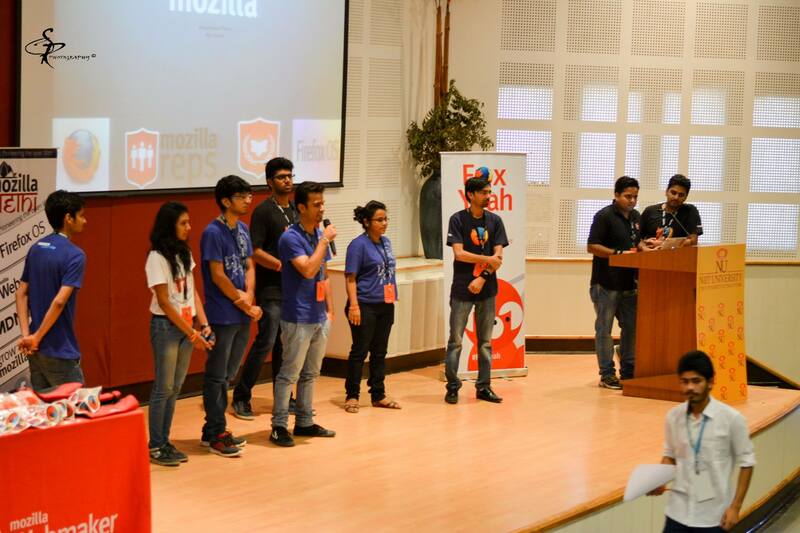 It has been a great event from my perspective to build and grow Mozilla community and spreading its mission. 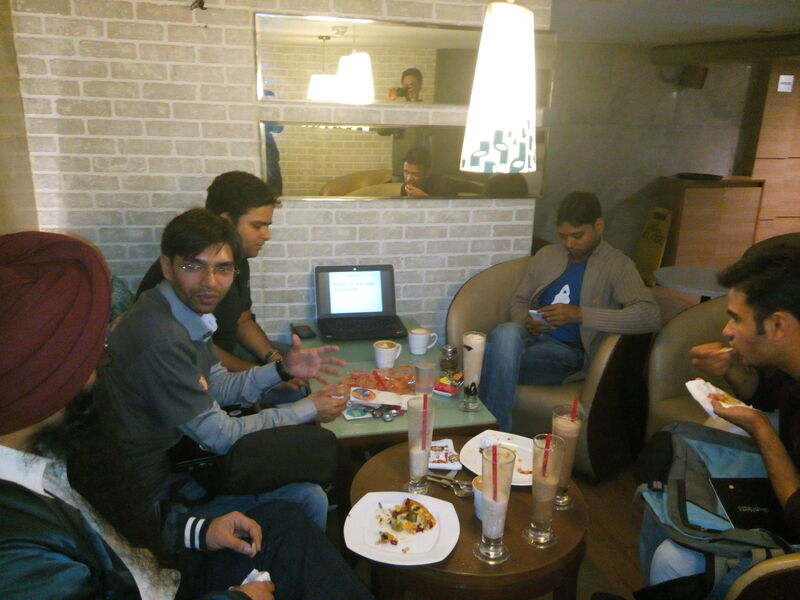 I am very Excited to share about Mozcoffee Meet up at Delhi. Finally a meetup had been organized By Mozilla’s Rep of the New Delhi NCR region at CCD Lounge,Cannaught place,New Delhi where all FSA’s ,Mozilla lovers, Mozilla Reps interacted to each other. Mr. Anup started the conversation by introducing himself first,the way he described himself is really inspirational, then all attendees along with Mr. Anup’s partners introduced to each other including me. I had already registered as FSA(Firefox student Ambassadors) before,as I and my friend very interested in contributing to Firefox OS and other Mozilla projects, so Mr. Anup started guiding us showing the path how can we start Contributing, from easy bugs to normal bugs, How can we communicate to Mentors of projects through IRC. 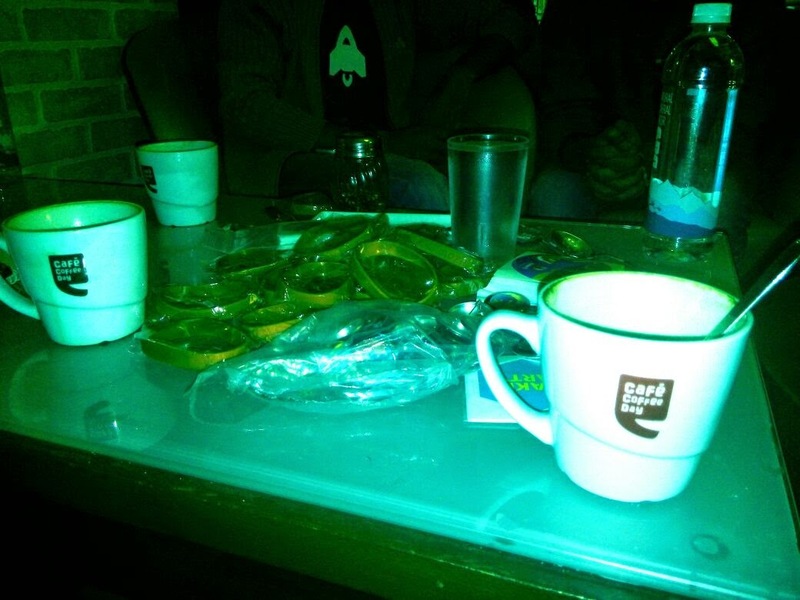 Then the best Part is CCD’s Coffee we ordered :). 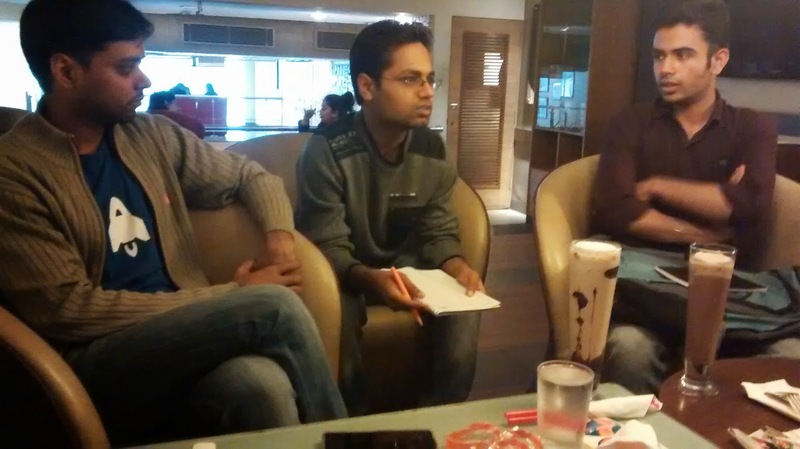 Anup discussed about the roadmap we have to follow to build some large community in Delhi NCR region. the Web, making an open source culture .He replied very positively assuring me that ,they will definitely conduct an Event there. I was really amazed and felt very determined when Anup has asked us about our skill set and mentioned Ruby On Rails has a really very wide scope and Mozilla also going to launch some open source projects based on RoR. At the Last he talked about Upcoming Intern Opportunities by Mozilla in US and we have to work a lot to reach there . It was really nice meeting open source Professionals,Mozillians who are volunteering for Mozilla supporting such a great mission of mozilla.